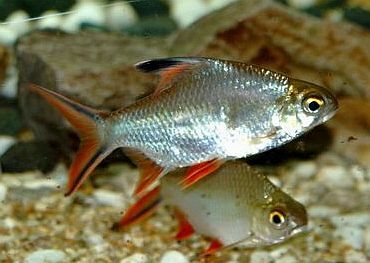 The eye catching Tinfoil Barb (Barbonymus schwanenfeldii) has large, distinct silvery metallic scales, red-tipped fins, a forked tail and grows up to 14″ in length. In nature, Tinfoil Barbs live in the larger, fast flowing rivers of Southeast Asia. Compared to other barbs, the Tinfoil Barb is a hardy, peaceful fish, and in natre is actually quite docile. For this reason Tinfoil Barbs make an eye catching addition to any large community tank. Tinfoil Barbs are a fast swimming school fish and should be kept in groups of at least 6 or more individuals. They can be housed with other large non aggressive fish but require a large (at least 70 gallon) aquarium with a tight fitting hood. Tinfoil Barbs are jumpers. In the aquarium they require good filtration and strong water movement. Adding powerheads to their aquarium is highly recommended. Tropical fish keeping enthusiasts agree that Tinfoil Barbs are easy to care for once they are set up in an acceptable size tank. They are easy to feed and accept most prepared commercial fish foods. They will eagerly chow down on pellets, flakes, freeze dried and frozen foods. In their natural habitat their diet consists mainly of algae and other plant matter. In an aquarium environment, they should occasionally be fed spirulina wafers or some other herbivore preparation such as the algae wafers that are given as a dietary supplement to Plecostomus. Tinfoil Barbs are normally purchased when they are 1″ to 1 1/2″ long, but since they quickly grow to over a foot in length, a large tank for these fish is an absolute must.